Isn't your Mach 1 an Avacado interior car? So you are using these as bases and re-foaming and recovering in Avacado? (04-05-2019, 06:42 AM)Boss1Ray Wrote: Isn't your Mach 1 an Avacado interior car? So you are using these as bases and re-foaming and recovering in Avacado? Using these as bases yes because my stock seat bottoms are rotted. I will be recovering them but the original interior color is white. I am really scared of doing white!! I'm a slob! Are you going to use the SMS comfortweave material as inserts or going with repros? Did all white interiors on Mach1s come with the argent stripes or are some plain? What do you mean the bottoms of your seats are rotted? are the frames still good? If they are, you should be able to recover your original seats. 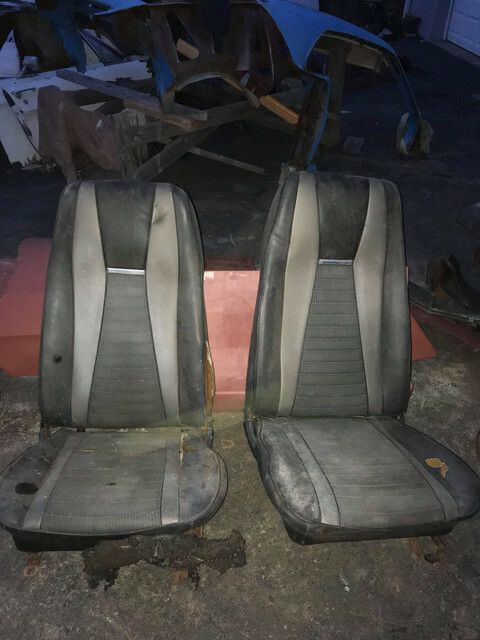 (04-05-2019, 07:24 AM)MikeGriese Wrote: What do you mean the bottoms of your seats are rotted? are the frames still good? If they are, you should be able to recover your original seats. Mike, Its the frames. They looked like they had say in water. Plus it looked like a heavy person had sat in them. The frames were crumbling and bent. The seat backs were good but I couldn't find just the bottoms. When I bought my J Code Vert in 2015, the dealer had swapped out the Mustang ll seats that had been in the car since the ‘70’s with a set of 71-3 seats. He put new covers on them. Of course, when I looked them over they were in rough shape. Full of rust and cracked and bent back rests and bases from abuse... I salvaged them. Had them sand blasted then welded the defective areas. Sent them out for powder coating and installed complete new interior foam padding and seats covers. Had to replace one of the tracks as well. They’d turned out great, but added a lot of expense that I wasn’t planning on... This pic is the car before the restoration (as received from the USA and this was the only time I risked driving it to a local coffee shop. She was rough...). I picked everything up yesterday and they were in great shape except for needing to be recovered of course. The side panels weren't chalky and passed the scratch test. They just need to be cleaned really good and then painted. The seat frames have some surface rust on them but not to bad. (04-06-2019, 07:42 AM)scgamecock Wrote: I picked everything up yesterday and they were in great shape except for needing to be recovered of course. The side panels weren't chalky and passed the scratch test. They just need to be cleaned really good and then painted. The seat frames have some surface rust on them but not to bad.